Including a character generation session, we had our third session of AS&SH last night. I reviewed it over four years ago but sometimes there's a world of difference between reading a game and playing it. So how does it play? As I've mentioned, as far as the rules go it is in many ways a cleaned up version of AD&D. A bit more complicated than Swords & Wizardry but nothing anyone with gaming experience would have trouble with. This writeup isn't designed to be a work of fiction, it's primarily an aid to my group to summarize what transpired in our adventure. Based on Jeffrey Talanian's adventure of the same name, which was in turn inspired by HP Lovecraft's short story "The Rats in the Walls". 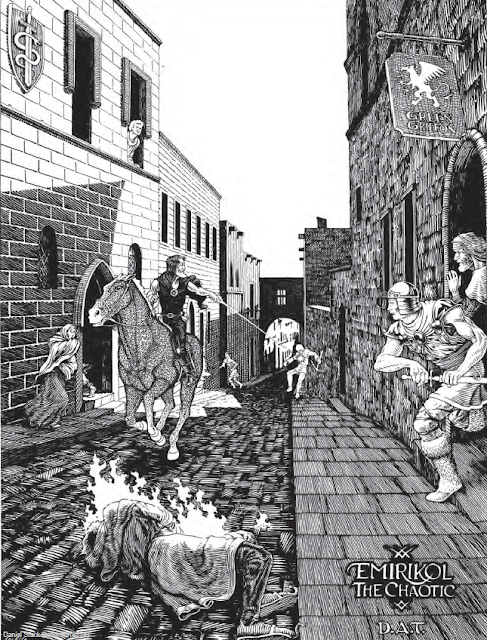 Our bold adventurers had paid a visit to the dockside tavern of the Silvery Eel in Hyperborea's greatest city, Khromarium. They'd heard it was a place to find adventure - even that the tavern keeper might have work he needed doing. I thought I'd be able to catch up on this year's RPGaDay upon my return from Manhattan but I've come down with a cold that I'm fairly certain is Captain Trips from The Stand. 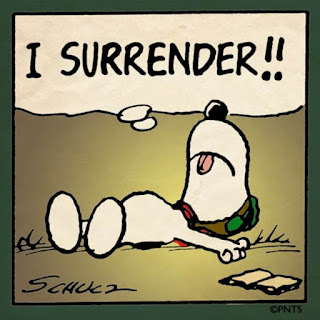 I've been alternating between sleeping and painful coughing. This has also caused me to miss out on some grad school work. Once I'm feeling a bit better that will need to be my priority. 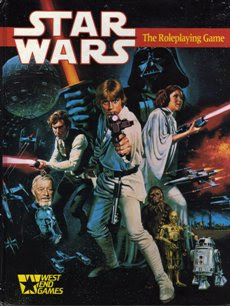 On August 11, when describing the Dead Game I'd Most Like to Return I nominated the original D6 Star Wars. Yesterday, just five days later, while waiting for a subway train I received an email from a player in our gaming group sharing with me the news that Fantasy Flight Games had just announced a limited edition reprint of the original D6 Star Wars game and its first sourcebook. I'm going to live with the illusion that someone at Fantasy Flight Games read my post and made the arrangements in record time. In all seriousness, I'm quite happy with this news. I've played D6 Star Wars recently and it has aged remarkably well. Probably for me though was when a bunch of us got together in the apartment my wife and I used to live in in the late 1990s. It was me, her, and two of her co-workers, gathered together to play Star Trek by Last Unicorn Games. Though I'd gamed off and on throughout the 1990s with family and friends, I hadn't had a regular gaming group since the 1980s. That game kicked off a series of campaigns that has had me playing pretty much constantly, albeit with hiatuses here and there, since then. The members of the group have changed and it's transitioned to a pure virtual group, but I've been fortunate to have regular gaming since that point. Day 14 - RPG For Open-Ended Campaign Play I like Call of Cthulhu for an open-ended campaign. While characters do advance, they tend not to ever get so powerful that they have nothing to fear. Indeed, as characters learn more magics they may find themselves close to insanity. Death, insanity, and retirement take many characters out of play but it is possible to add replacement characters to a group, to the point where there may be no original characters yet the campaign continues. Day 15 - RPG I Enjoy Adapting the Most I've done well using Fate for Star Wars and I've begun thinking of other ways it could be adapted. Day 16 - RPG I Enjoy Using As-Is I've found Call of Cthulhu works incredibly well as it is. It fits its genre well and has begun adding dials to make for pulp style experiences. This is more of a "show, don't tell". For me, the 1st edition Dungeon Masters Guide has the most inspiring interior art. From dramatic to goofy it sets the stage for an AD&D game. An almost-but-not-quite medieval society, with the influence of magic and monsters clearly evident. 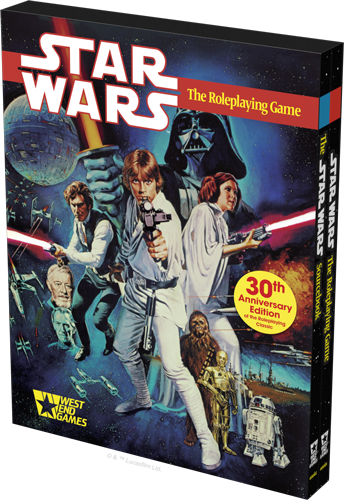 There is still a Star Wars RPGbeing published - three actually, by Fantasy Flight Games. I ran a campaign with Edge of the Empire and found it to be a perfectly enjoyable game. But for my money the incarnation I've the fondest memories of is the D6-based RPG put out by West End Games in the 1980s and 1990s. I literally played my first game of it the day I got it. It was so easy to play and so easy to GM - and it felt like Star Wars. The system wasn't perfect - I can see areas where a 3rd edition might have cleaned some things up. The Force rules worked well for wanna be Jedi type characters like Rey and Luke prior to being trained by Yoda. It required a bit too much dice rolling in combat. I found the stats for major film characters to be a bit over the top. Ten sessions isn't a bad length for some campaigns. 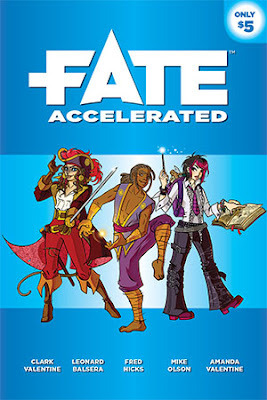 But from my recent experience Fate Accelerated works really well for something around ten sessions. The characters are pretty competent to start with - if you wanted to you could pretty much ignore advancement. If you do go for advancement your characters will advance pretty quickly, a nice way to model Luke Skywalker going from a farm boy to a Jedi Knight in a few sessions. I think Fate Accelerated would work fine for something a bit longer, though you'd want to slow down the default advancement. Dresden Files Accelerated gives some options on how this might be done. I've managed to play in a game or two of No Country For Old Kobolds, based on the Apocalypse World engine. It was a fast-paced game - we made our setting, characters, and played a quick scenario in under an hour. I died a horrible death. It's fun being the little guy. I have to be honest, I wasn't expecting to. The reviews and word of mouth for the film adaption of Stephen King's The Dark Tower were not just bad, they were awful. But King' Dark Tower series is one of my favorite reads of all time - I was going to see it for myself. I was feeling rather under the weather on Saturday, still getting over some nasty head congestion, but with such awful reviews I was a bit concerned the film would be in for a very brief engagement. My 12-year old, Jasmine, was very interested in seeing it. She's just about finished reading The Gunslinger. Of my two daughters, she's the geeky one, the one into comics, the one who has already read some Jack Williamson. Much to my surprise, I really liked it. Idris Elba made for a great Roland and Matthew McConaughey was a villainous delight as Walter/The Man in Black. It was critical to get someone good for Jake Chambers and Tom Taylor did a fine job. #RPGaDay 2017 Day 6 - I Can Game Every Day For a Week - What Would I Do? At the risk of sounding blasphemous, I don't know if this is actually something I'd want to do - if I had that much free time I'd probably use some of it for gaming, but I'd also want to do other stuff with that time. Some stuff with family, some geeking out - I think I'd be sneaking in a marathon Civilization game... Don't get me wrong, it's a hobby I enjoy a lot but it's hard for me to imagine having that much time, which might make answering it a bit difficult. For me the RPG cover that best capture the spirit of its game is from the game that got me into the hobby - the Erol Otus D&D Basic Set cover. 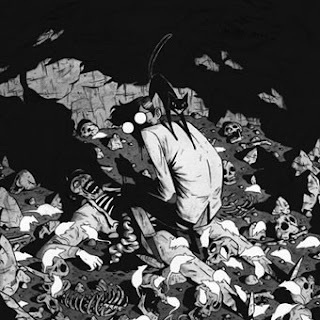 The treasure. The weird environment. The bold adventurers. And the dragon emerging from the water. It was very clear what the game was all about. I've two close runner-ups. The first is the first edition AD&D Players Handbook. Like the Otus drawing above, it captures what the game is all about. These aren't necessarily heroes, they're after the gemstone eyes. Finally, Call of Cthulhu has had some great art. My own favorite is the cover to the third edition.We've got a mysterious castle/house the investigators are approaching. These aren't hardened warriors. Even without the slithering horror it's a creepy scene, full of menace. Yog-Sothoth is the gate folks. 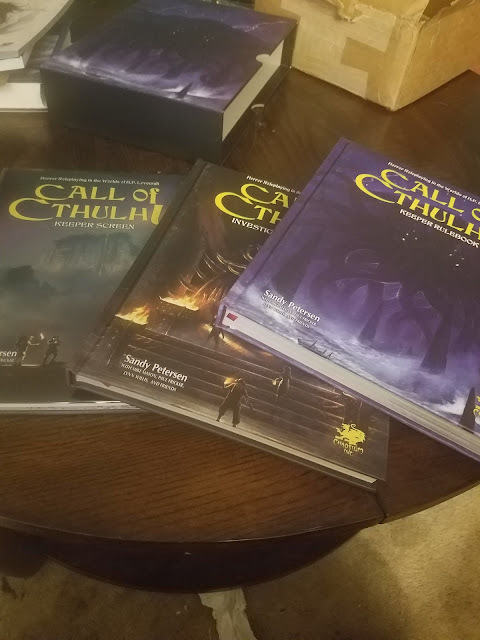 The past year has been a little bouncy, but I believe if I tally all sessions it'd come out with the most for Call of Cthulhu. That said there's been some variety. I finally had some success at GM-ing a Fate game, using Fate Accelerated for Star Wars. 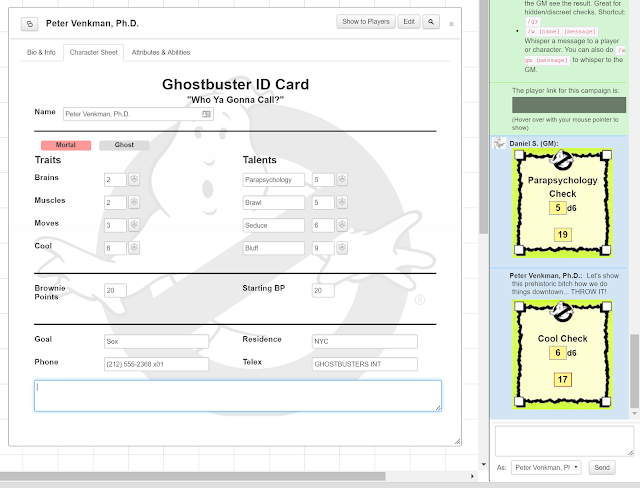 I also had a chance to GM the old D6 Ghostbusters which was great fun. I've had a chance to actually play some Apocalypse World Engine games which was a nice change of pace for me. This is going to be a shock, but I find out about new RPGs mainly through the internet. I suppose I can be a bit more specific. Once upon a time the answer would probably have been sites like rpg.net and ENWorld.org. 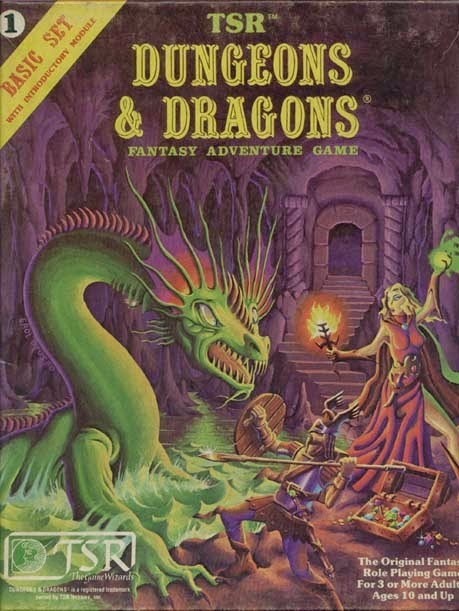 I remember visiting Eric Noah's website to get news about the upcoming 3rd edition of D&D (there was much talk about this "attack of opportunity" thing, though I believe I first encountered the concept from FASA Star Trek). 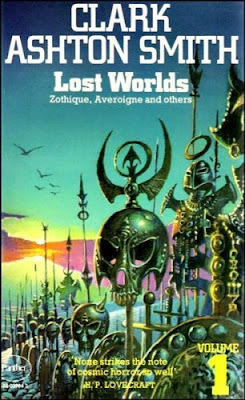 As a fan of Patrick O'Brian's Aubrey-Maturin novels, I'd love to see an RPG published that captures this series. There's a few Age of Fighting Sail RPGs out there, but I haven't yet found the "perfect" one. 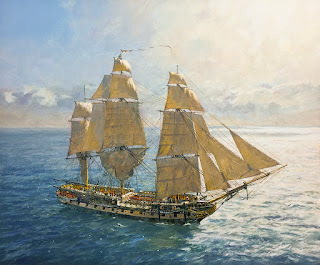 I'd want something that captures the feel of life at land and at sea, the social aspects of the era, and provides for exciting ship combats. It would need to manage the advancement of characters while also having a way to keep a group together. It would need to handle the passage of years, though for gaming purposes I'd be fine with it also making the year 1813 last as long as it needed to, much as Patrick O'Brian did. And it would need to appeal to people who aren't perhaps a tad obsessed with the genre. Given I've just kicked off an Astonishing Swordsmen & Sorcerers of Hyperborea game that's in one sense my answer - I'm not so flighty as to immediately wishing I was doing something else. 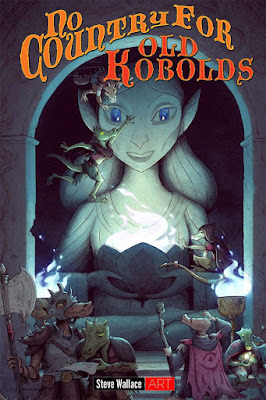 I've probably clocked a ton of AD&D in my life so I'm looking forward to playing a game with a setting inspired by my favorite authors (Clark Ashton Smith, Fritz Leiber, HP Lovecraft, etc.) with some rules based on AD&D.